The Norman motte at Shackerstone. Layers of history here! 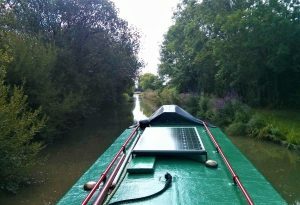 By mid-August Pea Green was turned around, having reached the end of the Ashby, and bobbing back along the canal towards Sutton Wharf and the Bosworth Battlefield Heritage Centre. First stop on my return journey was Shackerstone. There, I moored up for the night opposite a marvellous tree-topped motte. Instead of inspecting the remnants of a Norman castle I left the canal for another piece of transport heritage – the Battlefield Line. A volunteer run trainline whose steam engines chug through the Leicestershire countryside. 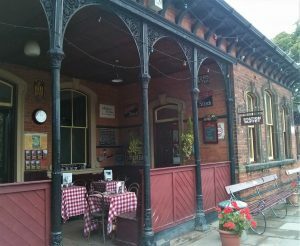 I had arranged to meet a friend at the station, so meandered up the towpath to the red brick Victorian station. With my platform ticket in hand I emerged from the ticket office, with its heavy ancient sofa and period posters, onto the platform. It all looked, and sounded, a bit ‘Brief Encounter’ and as a puffing train pulled in I half expected Trevor Howard to appear with an handkerchief in hand to remove the soot from my eye. I was all ready with my best clipped RP voice to respond. Strangely though, he didn’t appear. After ogling the steam train – what is the railway equivalent to the canal stare of gongoozling? My friend and I headed to the café for lunch. Every ledge, shelf and fireplace was full of fabulous old stuff – including some huge Brown Betty teapots – the café truly looked the part. ( Personally, I could do with acquiring some of those whopper teapots for painting!) The food too, also had a distinctly retro feel, which I don’t think was intended. In retrospect I should have stuck to admiring the teapots. Steam train arriving. Shackerstone Battlefield Line. My jacket potato arrived with a blob of margarine, a side ‘salad’ and a packet of salad cream. I looked aghast at the plate and quickly scooped off the marg before it could do any more damage. The salad consisted of sad lettuce – and my personal dislike -cucumber. The only saving grace was that the salad cream was in a packet. I am still staggered that food places in the UK buy salad cream, let alone try and serve it to unsuspecting paying customers. Some things should be relegated to the memory of the 1970s! My friend didn’t fair much better. She anticipated hot, homemade soup, but instead was served tepid Heinz tomato accompanied by a cold bread roll. We had planned to return for cake later in the day, but decided to give it a miss. 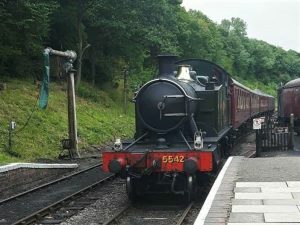 Watching the fabulous steam trains did make up for some exemplary bad British food. Let me know if you have better food experiences there – perhaps we just ordered the wrong thing? Towards Sutton Wharf, Pea Green trundles down the cut. Next day I headed to Sutton Wharf. Sutton Wharf was a top choice for mooring, combining history, a trading spot and SHOWERS! I moored on a lovely quiet pontoon with a couple of other boats – separated from the nearby footpath by lots of plants. The only challenge were the mooring rings, handily spaced to be of no use to a 32ft boat. I ended up with my stern line threaded between the pontoon planks to tie up. Once moored I did a recky of the showers. I should say I do have a shower onboard Pea Green, though it was a later addition. The shower tray is hidden under a hinged lid in the middle of the boat corridor. To have a shower the loo doors have to be fully opened up to create a cubicle across the boat. The shower curtain is then hung from hooks in the ceiling. Having found the Sutton Wharf showers I returned armed with shower equipment including flip-flops – OCD foot infection fear means always wearing shoes in showers I don’t clean myself and are shared. The wharf has two showers both located in large disabled toilets. Having precariously balanced my bag, clothes and towel on the extended door handle (why do these places never have hooks?) I eagerly pressed the shower button and turned up the heat. I stood there looking at the showerhead and nothing happened. Bugger. I looked around the room and couldn’t see any other way to turn on the shower. Not to be beaten I dragged on some clothes and headed to the shower next door. There I went through the same routine and again there was no water -AHgghghghghgghgh. Now I felt that my most marvellous shower plans had been truly thwarted. I had been so excited about being able to shave my legs, but this too appeared not to be happening. Once more I dragged on my clothes and headed into the Sutton Wharf café. I really hadn’t expected they would be able to help, but patiently waited as people ordered large slabs of cake and then enquired about shower operation. The kind woman behind the counter came out, left her apron behind and began pushing buttons and turning knobs. Then we cracked it – someone had turned off the emergency power switch to the shower. I pulled it on and water began to flow. Hurray! It was the best shower and even Monte commented on how clean and shiny I looked back on Pea Green and how my legs no longer resembled his ginger furry ones. The other exciting part of Sutton Wharf was re-visiting Bosworth Battlefield Heritage Centre. The last time I was there was 1981. 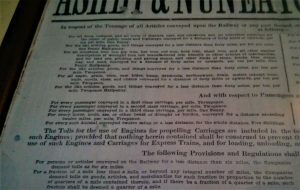 My enduring memory from that first visit is of a muddy field and an exhibition in a portacabin. I might, however have confused the loos with the exhibition in my wobbly memories! I was, after all, only 11 at the time. Since then much has changed. The location of the battlefield has been challenged and reassessed, a thought provoking memorial has been erected and a new state of the art museum has been created. All the things I like best – an authentic historical site, a memorial and a museum; lots of bits and pieces to critique, taking me back to the working world I used to inhabit. Memorial for a battle. An sundial in the centre marks time passing. 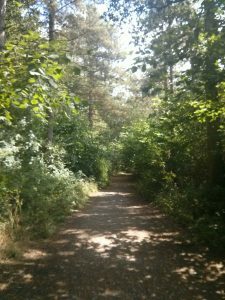 From my mooring at Sutton Wharf it is a short walk through Ambion Wood up a hill to the Heritage Centre. What I really liked is the way the centre weaves together historical research with heritage/tourist needs. As well as the exhibits the story of the Battle is told through video instalments from four characters – two male and two female – one being a child. I loved the fact that the first videos tell you the characters are speaking in modern English as we would struggle to understand the Medieval English or French they would have spoken in 1485. This nod to historical authenticity set the tone and immediately raised questions for the viewer. And of course I was more than delighted to see women’s voices alongside the men. A difficult task when so little evidence of female medieval life survives and when the focus is a male dominated battlefield. I often struggle with war related museum sites. All too often war is glorified or made into a grisly chamber of horrors that forgets the men who wielded the weapons. Often the wives, daughters, mothers and sisters are totally ignored. The impact of war on the female population, who may have been left behind is forgotten. I find historical battle re-enactments particularly troubling. I realise these pull in huge crowds to heritage sites, but for me re-enacting war which causes pain and death seems wrong. (Especially troubling are those men who choose to stride around in Nazi SS uniforms. I know they were originally Hugo Boss designs, but why would you want to dress as a genocidaire?) 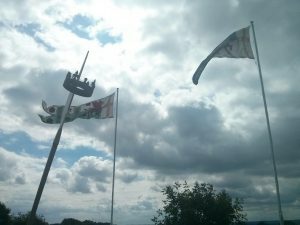 The Bosworth centre does its best to remove any glamorisation of warfare, and reflects the brutality of Medieval hand-to-hand combat. It also makes us question what happened to the families of the dead and wounded. 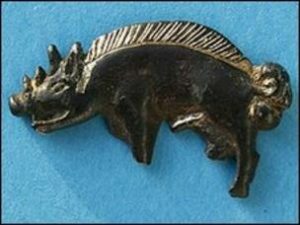 The most fascinating artefact, to me, was a tiny a 2.9cm silver boar badge. The boar, although in miniature can clearly be made out, with a tiny curly tail and stubby nose horns. I had already seen the white boar, Richard III’s personal emblem, on the street signs in Market Bosworth. These badges would have been worn by Richard’s closest supporters and knights. The one displayed was found in the mud in 2009. This was 524 years after it had fallen off the clothes of one of Richard’s followers in the midst of battle. Incredible on lots of levels – firstly amazing that it was found. Secondly, this tiny item may help pinpoint the location of Richard III’s death. As with any good history so many questions emerge. I can’t help but wonder about the craftsman who made it, and the man who wore it. Did he survive the battle? If he did, was he annoyed at losing this symbol of his loyalty? Who were his family? Questions we will never know the answers to. The final part of the exhibition is given over to the research and re-assessment of where the battle actually took place. All too often museum history is presented as a static ‘this is how it is’. The battlefield centre has rightly realised that the historiography of the site is as important as representing the battle itself. I wish more museums could find the space and the money to do this. Though I did feel a bit miffed that the muddy field I tramped through as an 11 year old, on my first secondary school trip, was just a muddy field and not the site of the battle. Is it too late to get my money back? All in all a centre and memorial that is well worth a visit, and I might even make the effort to get back there and re-visit in the coming year. My second day at Sutton Wharf was spent trading. I moved my boat onto a 24 hour mooring closer to the café (and the showers!) and set up shop. It was a good day of trading, helped by the sunshine, and I met some lovely people. A good mix of boaters, walkers and drive-in café goers. 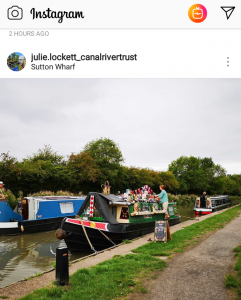 Also, it was great to share the space with CRT’s fundraiser Julie Lockett who was working hard to engage passers-by with the work of CRT, which non-boaters enjoy for free. As well as human company Sutton Wharf is also home to a flock of laughing ducks. They are clearly casing the joint and working out who, amongst the café goers, is going to share their food. They also seemed to be laughing hysterically every time a boat tried to moor in-front of the café. Usually just as the boat pulled in, dealing with the café patron audience, someone would run out of the café and tell the helmsperson they couldn’t moor there. This created great mirth amongst the ducks.